Legal Marijuana In Colorado Hasn't Stopped Racial Disparity In Arrests The state legalized marijuana at the start of 2014 for anyone 21 or older. An increasing rate of Latino and black youths were arrested for violating that age limit, even as the white arrest rate fell. 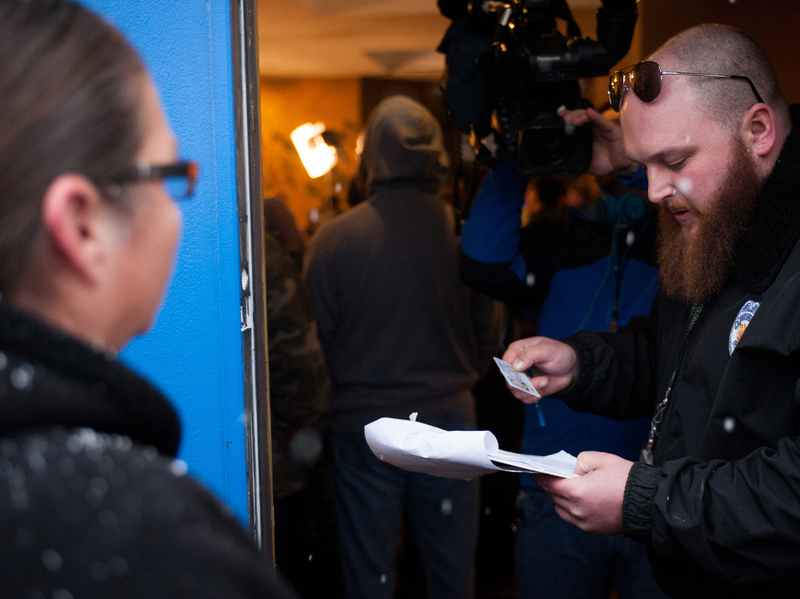 Kurt Britz checks a driver's license at the 3-D Denver Discrete Dispensary on Jan. 1, 2014, the first day recreational marijuana sales were legal in Colorado. Possession remains illegal for those under 21 years old, and statistics show a widening racial gap in arrests for those offenses. "They probably look at us more different," he says of police. "I don't think they think that white people would smoke as much as we do." A Colorado Health Department survey found there wasn't a huge racial difference in who smokes pot. But the marijuana arrest rate for white 10- to 17-year-olds fell by nearly 10 percent from 2012 to 2014, while arrest rates for Latino and black youths respectively rose more than 20 percent and more than 50 percent. That was evident that morning at the courthouse, where about a dozen cases were heard before noon. Only one involved a white kid. Brian Vicente, who led the marijuana legalization movement in Colorado, says that discrepancy needs to stop. "That is, I think, a large part of the reason Colorado voters passed legalization," Vicente says. "They're tired of the sort of racist legacy of the drug war." Vicente says it's shameful that local police have shifted their attention to minority kids. But Denver Police spokesman Sonny Jackson says it's not a matter of what police want to focus on, but what people are reporting to authorities. Jackson says that pot arrests for adults, of all racial groups, have been cut in half since legalization — and he emphasizes that marijuana is a low priority for the department. Keith Humphreys, who studies drug policy at Stanford University, says Jackson's explanation for the youth arrests mostly rings true. "Police do patrol more in neighborhoods of color, and they also get more calls to respond in neighborhoods of color," he says. And when police show up and find kids illegally in possession of marijuana, they're obligated to do something about it. Humphreys theorizes that the marijuana businesses themselves may be playing a role in who gets arrested. "The emerging legal marijuana industry is overwhelmingly white-owned and white-dominated, and provides good access to white customers," he says. "So one possibility is that that leaves the illegal market disproportionately composed of people of color, both the buyers and the sellers." That issue touches Wanda James, who owns the Simply Pure dispensary in a gentrified neighborhood in northwest Denver. It's a Friday, and there's a steady flow of customers in and out of her shop — most of them white. As a black woman, she is an anomaly in the industry, and news that minorities are being arrested at higher rates for marijuana offenses in the city makes her angry. But she points out the targeting of minorities by law enforcement is not just a Colorado or Denver problem — "there is not a major city, small town, rural county, city-county, outskirts, beach community that does not have this exact same problem" — and safe and legal access to pot clearly hasn't wiped that away.